Aviation Updates Philippines - The Philippine Air Force has received two more FA-50PH jets purchased from South Korea on Thursday, December 1. The delivery of the new fighter jets brings up the fleet of FA-50PH fighter aircraft to four, two of which were acquired in November last year. 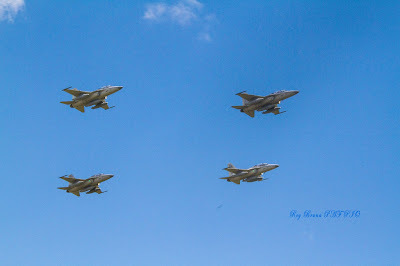 Before landing at the PAF Haribon Complex in Clark, the four aircraft made two flybys over Clark Field in a diamond formation. A water canon salute welcomed the new jets as they taxi to the ramp after landing. According to PAF spokesman Col. Antonio Francisco, the newly delivered aircraft, with tail numbers 003 and 004, were met by 001 and 002 FA-50PHs over Pangasinan area. KAI pilots Dongkyu Lee, Cheol Kahng, Donghak Shin and Huiman Kwon flew in the second batch of jets. The first two planes were piloted by Lt. Colonels Thomas Ryan Seguin, Maynard Mariano, Rolando Conrad Peña and Fabian Pedregosa. Defense Secretary Delfin Lorenzana, AFP chief Gen. Ricardo Visaya and PAF chief Lt. Gen. Edgar Fallorina led the ceremony and welcomed the aircraft upon touchdown at Clark Air Base. 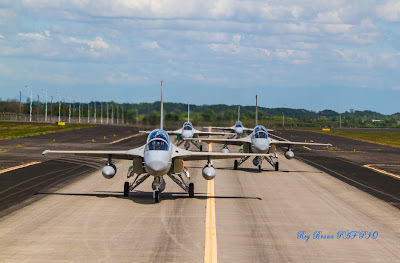 These aircraft will be assigned to the 7th Tactical Fighter Squadron, also called the “Bulldogs,” based in Basa Air Base in Floridablanca, Pampanga, one of the facilities that are slated to be used under the Enhanced Defense Cooperation Agreement between the Philippines and the United States. The Philippine government ordered 12 FA-50PHs from Korea Aerospace Industries in 2014. The remaining aircraft will be delivered by September 2017 based on the contract. The acquisition of jets costs P18.9 billion ($415.7 million) based on the budget.